Mary married George Lee (1820-1872) in around 1853 (probably at Rich Avon Station). George was a former convict who was tried in the Kent Assizes on 18 October 1831 and was sentenced to seven years transportation to Van Diemen's Land. He was transported on the SURREY which left England on 19 November 1832 and arrived at Hobart Town on 7 April 1833. The Convict Conduct Registers contained in the Tasmanian Archives show that he was transported for stealing geese and had earlier spent time in prison for stealing rabbits. While in Tasmania he continued to fall foul of the law, receiving: 25 lashes on 4 August 1834 for 'improper conduct to a Court'; a reprimand for drunkeness and bad conduct on 5 January 1835; 25 lashes on 18 January 1835 for drunkeness; and 3 days solitary confinement on 30 August 1836 for being disorderly and for fighting. According to one of his descendants, Bill Medlyn, George 'came to Victoria either with [John] Batman or very soon after. He must have been given a ticket of leave because he was a policeman in Geelong in 1839 and from there came up to the sheep station at Cope Cope on Rich Avon. He selected land at Carapooee in the 1860s.' George died in 1872 and was buried at St Arnaud. His tombstone reads: 'In memory of George Lee of Woolwich, Kent England. Died 17 May 1872 aged 52 years. Farewell! thou art gone to rest/Thy toils and cares are o'er/And sorrow, pain and suffering now/Shall ne'er distress thee more'. Thus saith the Lord. Set thine house in order: for thou shall die and not live (Isaiah 58)'. The widowed Mary married William Fyfe (1839-1931) at St Arnaud in 1875. The son of Samuel and Margaret Buchanan Fyfe nee Davie, William was born at Port Glasgow in Renfrewshire in Scotland. He trained as a blacksmith and travelled to Australia on the sailing ship CLUTHER. Accompanied by his brother, Samuel Fyfe, he travelled from Melbourne to Ballarat and thence to Stuart Mill where Samuel was operating the Greenock gold mine. William worked at Greenock for a time before pursuing his blacksmithing trade at Wright's shipyards back in Melbourne. After three years at Williamstown he returned to the St Arnaud area where he acquired some 500 acres of land near Whycheproof. During his time there he married Mary Lee and was with her as her six precious grandchildren were born and grew up. 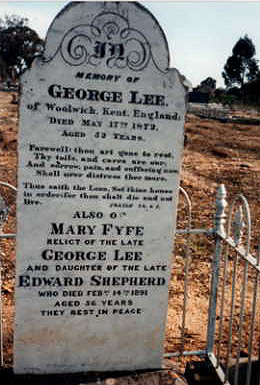 Mary Fyfe formerly Lee nee Shepherd died at St Arnaud in 1891 and was buried with her first husband George Lee, the words on his headstone being amended to read: 'Also Mary Fyfe Relict of the late George Lee and daughter of the late Edward Shepherd who died 14 February 1891 aged 56 years. They rest in peace'. After Mary's death, William sold his farm and returned to St Arnaud and then Melbourne where he engaged in a number of pursuits. He was back at St Arnaud in 1905 for the marriage of Mary's granddaughter, Philipa Medlyn, to another local, James McMullan Taylor (see below). In 1908 he revisited Scotland where, his obituary tells us, 'he found many alterations from when he left it as a young man'. On his return from Scotland, William lived at Western Creek with Mary's grandchildren who, as described shortly, had lost their mother there in 1910. 'Even though in his advanced years', his obituary concluded, 'he was never content to rest. The deceased gentleman was held in the highest esteem. He was an expert at his trade and a man who always conscientiously did everything entrusted to him. He is one of the older generation who set a special value on giving service'. Mary and William had no children. She and George had only one child, a daughter, Mary Lee (1854-1910), who was the first white child born at Salt Lakes near Cope Cope. Mary married James Henry Medlyn (1843-88) at St Peter's Anglican Church at Carapooee on 8 May 1873. Their wedding certificate indicates that James was born at Wendron in Cornwall, the son of William Medlyn (1800-1889) and Martha Jenkin (1803-89) both of whom were also born at Wendron. The 1851 and subsequent English censuses show that William and his sons were farmers, their holding being 40 acres in 1851 and 70 acres in 1881. The 'Medlyn' 'Shepherd' and other family trees on Ancestry tell us that William and Martha had at least eight children: Joseph, John, Mathew, Phillippa Johns, Grace Jenkin, James Henry and Martha Anne Medlyn. Ancestry's Unassisted Inward Passenger Lists to Victoria, 1852-1923 shows that James (21) and his brother Joseph Medlyn (28) emigrated to Victoria on the QUEEN OF NATIONS in 1872. At the time of his marriage to Mary, James was farming land at Stuart Mill. Mary was a nineteen year-old spinster living at her parents' home at Carapooee. According to Paul Clatcher, Carapooee is an aboriginal name meaning 'Land Of Plenty'. It came into existence as the result of the discovery of gold about 1855, as the prospectors were going north to New Bendigo, now known as St Arnaud North. The prospectors sank several holes on Peter's Station and found a little gold, but it was not until 1862 that the alluvial mining commenced. The district was then known as Peter's Diggings. The early pioneers reaped rich rewards from shallow sinking in the sources of the leads. The deepest sinking was at forty feet and claimed to have been the most payable. Other alluvial fields were known as 'She Oak', Cornish Hill (side of the school)...Bragg's Hill... Pollard Hill... and Frenchman's Hill. Gold Mining lasted 10 years. WELL KNOWN WESTERN CREEK RESIDENT. A sad drowning case was reported to the police on Wednesday, the victim being the well known and highly respected resident of Wesrern Creek, Mrs Mary Medlyn, relict of James H. Medlyn, who died many years ago. It seems that Mrs Medlyn, who was 56 years of age, left the house at about quarter to one o'clock on Wednesday morning and went to the creek, about four chains away, to wash some buckets, a custom she had followed for many years. As she had not returned by quarter to ten, the eldest daughter, Miss Martha Medlyn, went over to the creek and was horrified to find her mother floating in the water, which was about 2 feet 6 inches deep. Miss Medlyn called her sister, Alice, over to see what had happened, and then informed their brothers, James and George, who were working in a paddock about 20 chains away. The sons quickly removed the body from the water and tried to restore animation, but without success. Dr H. H. Fleming was called in, but Mrs Medlyn was past all aid. Deceased was subject to dizziness and had suffered for a considerable time headaches due to chronic indigestion. A magisterial inquiry was held on Thursday morning at Western Creek by Mr R. Slaone JP. Evidence was given, and the magistrate found that death was due to accidental drowning. Deceased, who was the only daughter of the late Mr George Lee, was born at Rich Avon Station in 1854. She was married at St Peter's Church, Carapooee, and subsequently with her late husband settled at Western Creek. A family of six are left: Mrs R. Wembridge, Watchem; Miss Martha Medlyn, Western Creek; Mrs James Taylor, St Arnaud; Miss Alice Medlyn, Western Creek; Mr James Medlyn, Western Creek and Mr George Medlyn, Western Creek. boy in the picture suggests otherwise. We are both hoping someone may recognise those pictured and help us solve the mystery. 1) Mary Grace Medlyn (1873-1960) married Robert Davis Wembridge (1873-1934) in 1902 probably at St Arnaud although this has to be confirmed. Robert was the son of Thomas Frederick Wembridge (1819-98). According to Yvonne Palmer's history of St Arnaud, Track of the Years, Thomas was born into a farming family of Ashill in Devon and attended school at Brighton. 'On leaving school he had been apprenticed to a malster but soon forsook his trade to follow other occupations in various countries until wanderlust led him to the Victorian goldfields'. In 1852 Thomas sailed from England to Australia on the STATESMAN whose passengers included two other Brighton school attendees, Frederick Steward and James Greville. After their arrival at Port Philip on 23 September, the three friends headed inland to the Avoca-Amherst district where they and five other colleagues prospected for gold. Having little success the group decided that Wembridge, Steward and two others should explore the area around Carapooee and beyond and send for the remainder once a suitable prospecting site was found. As Palmer describes, they eventually discovered a rich lode in a place they named 'New Bendigo' (later St Arnaud north) and were able to work it for several months before word of the find got out and the inevitable rush of miners and other hopefuls took place. The 'Hecker and Kick Family Tree' on Ancestry informs us that Thomas married Diana Davey (1836-1920) at Dunolly in 1860 and had nine girls and one boy, Robert Davis Wembridge, who was born at St Arnaud in 1873. Thomas eventually settled at St Arnaud where he bought a 30-acre block of land on Lexell Creek. There he established a large and productive garden that became a show place for townspeople and visitors alike who would partake of sumptuous afternoon teas beneath Thomas' blossoming fruit trees. According to the Argus newspaper, Elsie Wembridge (1903-55) married a farmer from Nar-Nar-Goon near Pakenham in Victoria, Rowland George Moore (1898-1968), at Christ Church St Arnaud on 11 April 1925. The Australian electoral rolls show Elsie and Rowland living on his farm at Nar-Nar-Goon in 1931. By the time of the 1936 election they had moved from Nar-Nar-Goon to Geelong where Rowland worked for a time as as a hairdresser before again farming at Moolap. They continued living at Moolap until Elsie's death there in 1955 and burial in the Geelong Eastern Cemetery. Although still to be confirmed, we think Rowland then returned to Melbourne where he died at Mitcham in 1968. The electoral rolls indicate that he and Elsie had at least one daughter, Fay Moore, who was working as a teacher in Geelong in 1954. 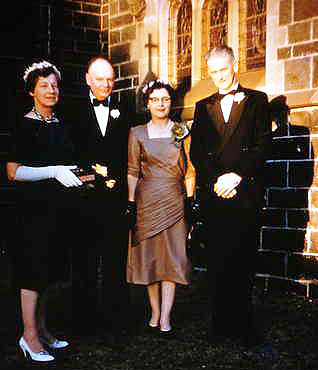 Elsie's sister, Marian Wembridge (1905-86) married George Alfred Yorston (1901-78), the son of John Yorston and Mary Grace Mcconchie, at Glen Huntley in Melbourne in 1930 (Marion and Alfred are the first two in the photo on the left which was taken at the wedding of their daughter, Mary Diana Yorston, to Frank Coulter whose parents, Keith and Amelia Coulter nee Brundsdon, are the other two in the photo). The Australian electoral rolls show that after their marriage Alfred, who worked as a draughtsman, and Marian, a school teacher, lived in the Melbourne suburbs of Mentone, Hawthorn, Deepdene and Balwyn (where George died in 1978). The Ryerson Index shows that a Marian Yorston died at the St George's Hospital in Melbourne in 1986, aged 82 years. She is buried at the Springvale Botanical Cemetery (Dr McLorinan Lawn, Row T, Grave 47). According to the 'Brunsdon Family Tree' on Ancestry (which was also the source of the photo), Marian and Alfred had only the one child, Mary Diana Yorston, who as we have seen, married Frank Coulter sometime before 1963, The Australian electoral rolls show they both trained as teachers and lived in Melbourne while Frank studied for his doctorate at Monash University. They were registered at Townsville in 1977 and Claremont in Western Australian in 1980 (Frank was described as a lecturer in both places while Diana was an occupational therapist). Although still to be confirmed, we think Frank was the Dean of Education at the University of Western Australia before, at the end of 1980, being appointed as Head of Education at the Canberra College of Advanced Education (later the University of Canberra). The 'Brunsdon family Tree' tells us they had three children, all of whom married and provided their parents with at least five grandchildren. While in Canberra the family lived in the lake-side suburb of Yarralumla. The 'Smith Family Tree' on Ancestry informs us that Martha Lee Wembridge (1918-2003) married John Corneille Smith (1912-2005) and had at least one child, still living. John was born at Henty in NSW and served in the Australian Army between April 1942 and December 1945 (at which time he was a Cpl in the 2/1 Australian Armoured Recconnaisance Squadron). In civvy street he worked as a grazier and later a stock salesman at Yarrawonga on the Murray River. It seems they spent the latter part of their lives on the Mornington Peninsular where Martha died in 2003 and John in 2005. According to the Australian Archives Mary and Robert's two sons, Thomas Medlyn Wembridge (1910-67) and Robert Fyfe Wembridge (1914-86), both served in the Australian armed forces during the Second World War (they also show that Thomas had earlier served with the 22 Militia Battalion initially as a private soldier and later as an officer). Thomas was then working as a garage proprietor at Mirboo North in Gippsland and was married to Doreen Marjorie Jean Milner (1913-99), daughter of George Milner (1886-1966) and Margaret Jane Williams. They continued to live at Mirboo North after the war. Thomas died there in 1967 and was buried in the local cemetery. His headstone reads: VX53837 Lieutenant T. M. Wembridge 2/5 Infantry Battalion 11 August 1957, aged 57. Dearly loved and sadly missed by wife Marjorie, daughter Joy and son Ian'. Marjorie died in the Traralgon Hospital on 4 October 1999 and was buried with Thomas at Mirboo North. Her tribute, published in the Herald Sun on 5 October, tells us she was the 'dearly loved Mum of Joy and Bruce [and] Ian and Kanjana. Nana of Anthony, Darryn, Nicole and Michael, Troy, Lee, Ketsara, Ping and Bow. Great Nana to many'. The Australian electoral rolls show that Thomas' younger brother, Robert, worked as a butcher's assistant and was living with his mother, Mary Grace, on Canterbury Road in St Arnaud at the time of the 1936/7 and 1942 elections. He served in the Australian Army from March 1941 until November 1945 his last posting as a Cpl in the 3 Australian Base Supply Depot. Sometime after this he married Bernice May Robinson (1918-82), the daughter of Angus Roderick Robinson (1892-1980) and Ettie Proven Cadzow (1893-1961). At the time of the 1949 and 1954 elections, Robert and Bernice were living on Watson Street in Charlton where Robert was working as a 'superintendant'. Ancestry's index of Australian bdms show that Bernice died at Portland in Victoria in 1982. Her headstone in the Portland Cemetery tells us she was the devoted mother of Peter, Ross, and David'. Robert, or Bob as he was known as, died at Portland four years later and was buried with Bernice. 2) Philippa Lee Medlyn (1879-1957) married James McMullan Taylor (1869-1927) at the Medlyn residence at Western Creek near St Arnaud in 1905. 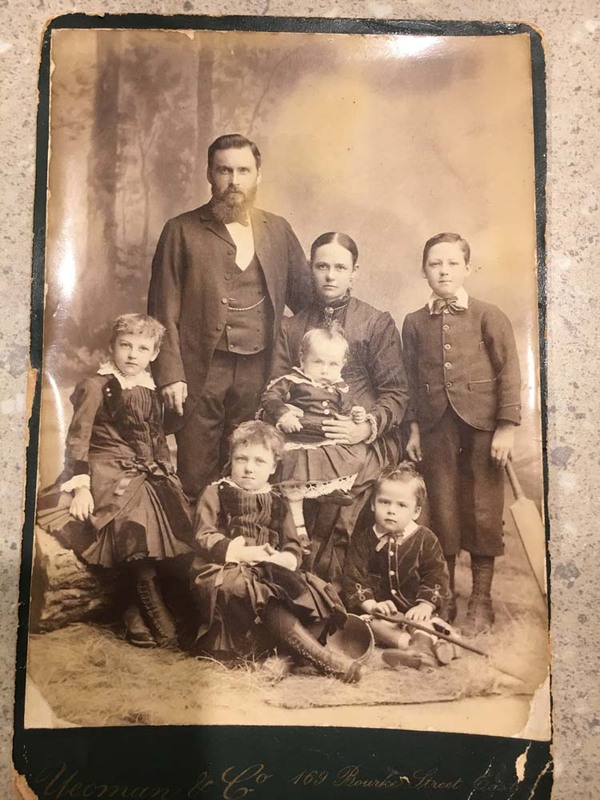 According to the 'Jody Taylor Family Tree' on Ancestry, James was the son of an Irishman William Taylor (1830-1905) and Prudence McMullen (1840-1904). The same source contained the following newspaper report of the wedding: 'A quiet but pretty wedding was celebrated on the 10th inst., Mr J. Taylor of St Arnaud, being married to Miss Phillipa Medlyn, third daughter of the late Mr J. H. Medlyn. The ceremony which was performed by the Rev. Mr Beeman, of Donald, took place at the residence of the bride's mother, Western Creek. The bride, who was given away by her uncle, Mr W. Fyfe, was attired in white silk; wreath and veil, and carried a bouquet of heath and fern. The honeymoon was spent in Gippsland. The bride's travelling dress was of blue Panama cloth; black hat trimmed with tuile and feathers. A large number of valuable and useful presents were received'. 1) Arthur James Taylor (1906-96) who married Jessie Griffith (1910-2007), the daughter of Owen Griffith and Helena Flett, in Melbourne in 1937. The Australian electoral rolls show they lived with Arthur's mother at Coburg until after the war when they moved to Carrum. Arthur, who then worked as a public servant, and Jessie had four children: Bernard James, Gwenda Lee, Dawn and Phillip Taylor. 2) Harold George Taylor (1909-75) who married a South Australian, Dora Fay Copas (1905-2011), in Victoria in 1936. Dora's parents were John Percy Copas (1882-1978) and Alice Susette Gameau (1882-1968) who were married in Adelaide in 1905. After their marriage, Harold, who worked as a clerk, and Dora lived at Port Augusta in South Australia where, according to the Department of Veterans Affairs' WW2 nominal roll, he enlisted in the Australian Army on 9 April 1942. He served until October 1945 by which time he was a L/Cpl in the 6th Battalion VDC. The Ryerson Index shows that a Harold George Taylor, 'late of Payneham South in South Australia and formerly of Moreland and Port Augusta', died at Adelaide on 27 March 1975, and a Dora Fay taylor, 'formerly of Port Augusta', died at Adelaide on 18 January 2011, aged 105 years. We haven't as yet been able to determine whether they had any children. 3) Frank Medlyn Taylor (1917-67) served in the Australian Army from September 1942 until October 1945 by which time he was a Corporal in 2/163 Australian General Transport. After the war he worked as a salesman and lived with his mother in the Melbourne suburb of Coburg until her death there in 1957. We have not been able to trace him after that although we do know he died in Melbourne in 1967 and is buried with Phillipa in the Anglican section of the Coburg Cemetery. 3) George William Medlyn (1890-1939) married Jane ('Jean') Thwaites (1890-1975) at Carapooee in 1920. The Thwaites family website tells us that Jane's parents were John Thwaites (1855-1935) and Jane Donald Murray (1856-1945) who came respectively from Daylesford and Rushworth in Victoria and farmed at Carapooee West. Her siblings were Elizabeth Ann, William Thomas, Isabella, Robert, John and James Thwaites. George, who farmed land at Western Creek near St Arnaud, and Jean had three children: George Lee, William James and Frank Murray Medlyn. George Medlyn senior died in 1939. His wife Jean died in 1975 and was buried at St Arnaud. We believe their eldest son, George Lee Medlyn (1921-94) and his wife Elvie Smith had no children. He worked as a sheep farmer and wool classer but also became an avid collector of rare colonial bottles. In 1885 he bought a former Clunes school house that was then being used as a knitting mill to house his bottle collection. According to an article written in 2009 by Madeline Jenkins and published in the local Advocate, 'with more than 6000 bottles on display, the Clunes Bottle Museum now houses the largest bottle collection on display in Australia. Mr Medlyn continued collecting bottles until his death in 1994, when he bequeathed the collection and building to the Shire of Talbot and Clunes. The museum's committee members are currently redesigning the displays and exhibition spaces with the help of a $20,000 grant from the Hugh Williamson Foundation. Ms Turner said every bottle in the collection was unique and, when the project was complete, the museum would be a great educational tool and tourist attraction'. Robert White tells us that George and Jean's second son, William James Medlyn married Thelma Amy Wright at St Arnaud in 1948 and had eight children. Their youngest son Frank Murray Medlyn and his wife Elizabeth Withers had no children. Ann Maria (pictured on the left) married Abraham Joseph Allen (1825-68) at Rich Avon station on 28 January 1854. The couple's wedding certificate shows that Joseph was a shoemaker who was born at Bacton in Suffolk and was then living and working at Swanwater. His father was Abraham Allen, a labourer. The marriage, conducted according to the rites of the Independent Church, was witnessed by William Price and Edward Shepherd where all parties signed the document. After their marriage Ann and Abraham lived at St Arnaud where they had four sons before Abraham's death at St Arnaud in 1868: Edward Allen (1860-c1912), Abraham Joseph Allen jnr (1864-1937), John Robert Allen (1865-1940) and William Allen (1868-1915) - see below for details. Two years after her first husband's death, Ann Maria married Abraham Jones (1828-90), the son of Thomas Jones and Lydia Gilmore, at St Arnaud. 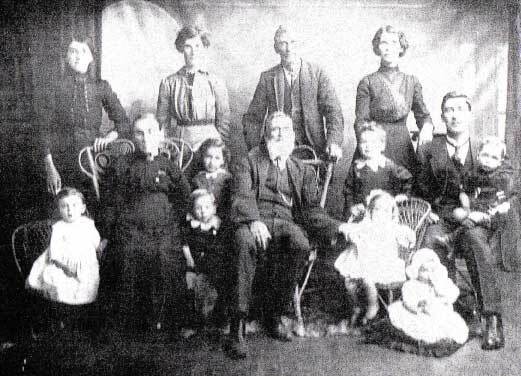 Robert White tells us that she and the second Abraham had three children: 1) Annie Maria Jones who was born at St Arnaud in 1871 2) Lydia Ann Jones (1874-1948) who married George Brown and had at least two children: James William Brown (1896-1967) who married Agnes McDonald, and Ethel May Brown (1898-1960) who married Percival Thomas Hewitt and had four children; and 3) Amelia Jane Jones who was born at St Arnaud in 1877 and died there a year later. The local burial record notes that Amelia is buried in the same enclosure as her parents and next to her cousin Grace Victoria Allen, who died in 1890, the same year as Ann Maria's second husband, Abraham Jones. Ann Maria lived on for another twenty years. The 1903 electoral roll showed her living at St Arnaud East. In 1909 she was registered as living on Inglewood Rd in St Arnaud (as was an Amy Jones). She died, aged 75 years, at St Arnaud in 1912. What of her and Abraham Joseph Allen's children? 1) Edward Allen who was born at St Arnaud in 1860. The 1914 electoral roll for the Grampians Division of Victoria showed an Edward Allen, who was working as a labourer, living at Gowar East. He was still registered there at the time of the 1919 election but was not there in the 1924 roll. 2) Abraham Joseph Allen (1864-1937) who farmed land at Kooheh (north of Carapooee) from at least 1914 to the time of his death in 1937 (he was buried at St Arnaud). Joseph, as he was also known, married twice. His first wife was his cousin Annie Louisa Shepherd (1871-1913), the daughter of Robert Shepherd and Mary Ann Seales. Annie was just sixteen years old at the time of her marriage. She and Joseph are pictured on the right with their children Annie and baby Joseph. 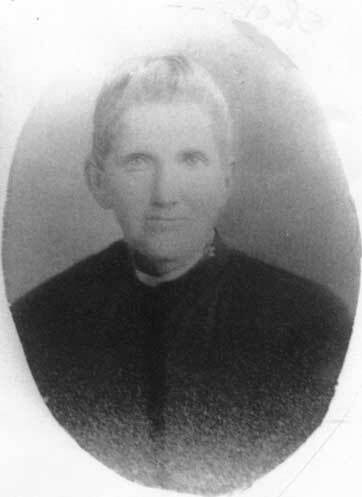 Annie Louisa Allen nee Shepherd died at St Arnaud in 1913 and Joseph married her younger sister, Ann Ellen Shepherd (1877-1923) the following year. Ann and Joseph had one daughter, Thelma Allen who died, aged 13 years, at St Arnaud in 1929, six years after her mother. 2.1) Annie Allen (1887-1973) married Thomas Kelly in 1912 and had at least two children. 2.2) Elizabeth May Allen (1891-1975). Born at St Arnaud, May married Victor William Cole (1887-1942) there in 1912. Victor was also born at St Arnaud, the son of Daniel Cole and Jessie Hawkins. The Australian electoral rolls show that May and William lived on their farm at Kooreh South from 1914 to 1942, the year of William's death. It seems that after this May lived initially with her sons (Allen, Robert Arthur and William Albert Cole, all farmers) at Emu and, from around 1949, at Inglewood where she died in 1975. With her at Inglewood in 1954 was her son William Albert Cole who was then working as a wood merchant. 2.3) Fanny Allen (1893-1923). Also born at St Arnaud, Fanny married Henry ('Harry') Howard there in 1913. Robert Shepherd's 'Shepherd Family Tree' on Ancestry.com tells us that Harry was born in 1872 at Ballarat East, the son of William Howard and Elizabeth Holstock, and that he and Fanny had a daughter, Annie Esther Howard, who was born at St Arnaud in 1919 and died in Ballarat in 1964. The Australian electoral rolls show that after their marriage the couple also lived at Kooreh where Harry worked as a labourer and where Fanny probably died although that has still to be confirmed. 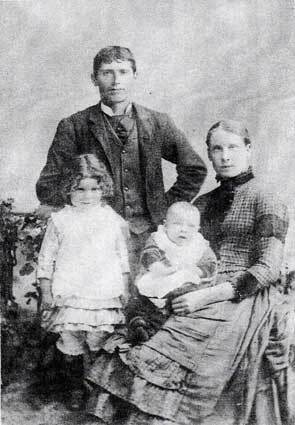 The photo below of the Allen family indicates that Fanny and Harry may have had a second daughter, Florence (or 'Florrie') Howard. While we have not been able directly to confirm this, the 1942 electoral roll does show an Annie Esther Howard, a waitress, Florence May Howard, home duties, Frederick Forbes Howard, a pastry cook, and Grace Evelyn Howard, home duties, all living at 3 Sleeth Avenue in Dandenong. According to the 'Ward Family Tree' on Ancestry.com, Annie Esther Howard married Kenneth Thomas Ward (1920-2003), the son of Charles Ward and Bessie Kempson, and had at least one child still living. 2.4) William Robert Allen (1894-1975). His military record contained in the Australian Archives shows that William, the son of J. Allen of Kooreh via St Arnaud, enlisted in the 1st AIF on 3 August 1915 and was alloted to the 6th Reinforcements for the 21st Battalion. He was disembarked from the MOLDAVIA at Fremantle with measles and was re-embarked on the ULYSSES on 2 November 1915 as part of reinforcements for the 28th Battalion. Following several bouts of sickness in France and England (including gangrene), he was transferred to the Australian Provost Corps and attached to the 2nd Division in France in 1918. He returned to Australia on the ZEALANDIC in 1919. The 1919 and 1924 electoral rolls have William Robert Allen, a labourer, living at Kooreh with his father Abraham Joseph (and, in 1919, his step-mother Ann). Both Robert White and Robert Shepherd believe that William later married Jean Frazer and raised a family at Geelong where William died in 1975. Sent to us by Robert White, this photo is of Abraham Joseph Allen jnr and his family taken in around 1915. Rear row (L/R): Fanny Howard nee Allen, Elizabeth May Cole nee Allen, Abraham Joseph Allen jnr, Annie Kelly nee Allen. unknown and Mary Kelly, Joseph Allen with Merle and unknown Allen. 3) John Robert Allen (1865-1940). Also a farmer, John married Eliza Ellen Coles (1868-1960) at St Arnaud in 1890. According to Catherine Devine's family tree and the Pataky Family Tree on Ancestry.com, Eliza was the daughter of James Coles and Eliza Surkeet. They had nine children born at St Arnaud between 1890 and 1912: 1) Joseph Robert Allen, a farmer and labourer, who married Myrtle Amy Watkins and lived at St Arnaud all of his life. 2) Maude Authurine Allen. 3) Annie Victoria Marie Allen (1899-1988) who married Daniel Cecil Devine (1898-1968), the son of William James Devine and Bridget Greenwood from Young in NSW, at West Wyalong in 1919 and had ten children. 4) William Edward Allen (1894-1985). 5) John Leslie Allen (1896-1897). 6) Ruby Pearl Allen (1902-2002) who married Cyril Percy Cecil ('Ted') Welsh (1899-1980), the son of Michael Bendel Welsh and Caroline Howlett, at Wyalong in NSW in 1919 and had five children (see Peter Davies' Rootsweb site 'Davies Down Under' (25 Aug 2001) and Mark Landrigan's 'Landrigan Family Tree' on Ancestry.com. 7) Evelyn May ('Dolly') Allen (1902-1989). 8) James Leslie Allen (1905-1986) who is buried at St Arnaud in the same grave as his brother John Leslie Allen (who died in 1897). 9) Sydney Allen (1912-1984) who worked as a miner and was living with his mother and siblings on Powell St in St Arnaud in the 1940s. 4) William Allen (1868-1915). William's burial record indicates that he was a farmer. There is no indication that he married or had children. Joseph and Annie Allen nee Shepherd and Abraham Joseph Allen and family courtesy of Robert White.